Thomas O’Connor, the FBI special agent who is volunteer president of the FBI Agents Association, said on Tuesday that it’s not normal for him to be sitting in front of news cameras. But nor is it “normal” for chunks of the government to be shut down so that the group’s nearly 14,000 members, among others, are not collecting paychecks. So the association took the rare step of collecting anonymous, volunteer statements from special agents nationwide documenting the harms that the funding freeze have inflicted on investigations, travel, training, payments to confidential sources and employee benefits. This Friday will mean more than “30 days without pay, which is not sustainable,” O’Connor told reporters. “It’s sad” and “disgusting” that the bureau’s law enforcement professionals “have been let down by our elected officials.” He described how his wife—also a special agent and his boss—worked with her Virginia book club to collect and deliver a truckload of food to “FBI family” at a field office, which is happening all across the country. “I never thought I would say this” about the federal government, O’Connor said. The majority of FBI employees remain on the job, though without pay. And following a petition presented on Jan. 10 to the White House and congressional leaders demanding immediate funding for the bureau, the group’s new report–titled “Voices from the Field: FBI Agent Accounts of the Real Consequences of the Government Shutdown”—will go to all lawmakers. 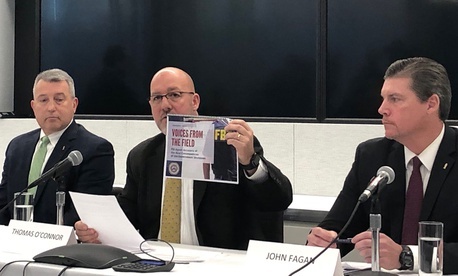 It quotes regional agents lamenting in detail that O’Connor called “vivid and troubling” of how, for example, local crime victims working with the FBI do not receive the usual counseling. Witnesses planned for court proceedings are “not getting the fees and per diems, though the criminal trials will go forward,” O’Connor said. And in one division, “we don’t have a single Spanish-speaking” staffer available, so for a violent crime case, in which 13 from the infamous MS-13 gang have been indicted, the FBI has to interview using a three-way phone connection. As they did in the group’s petition, the leaders of the 14,000-member association stressed that the shutdown and absent paychecks put agents’ security clearances at risk. “Every family in the FBI has mortgages, car payments and bills at the end of the month—try doing that without a paycheck,” O’Connor said. It’s especially tough on the newer employees, he said. Vision and dental health benefits are now frozen because of furloughed support staff, O’Connor added, and retirees, some of whom spent 20 years “risking their lives for the government” face delays in their first retirement checks—with no ability to use the typical leftover annual leave as paid days during the shutdown. He declined to answer questions about the politics of the shutdown, citing the group’s nonpartisan mission and his stance of speaking as a volunteer, not on behalf of the bureau. “It’s very frustrating because we have to put up with enough roadblocks during our jobs to begin with,” said Special Agent John Fagan, who, forced to economize, just had to tell his 11-year-old son they couldn’t play weekend laser tag. The association has also been working with headquarters to raise the $3,000 annual limit on special agents’ outside employment. “FBI Special agents should not have to go to a store and stock shelves to feed their families,” O’Connor said.